"Our School Mission is to prepare students to thrive in university and beyond. This mission will be accomplished by creating an environment of high expectations of achievement, behaviour and service. Webber Academy was incorporated in 1997 as a non-profit company with a mandate to be a high quality, non-denominational, co-educational, university preparatory, accredited private school. 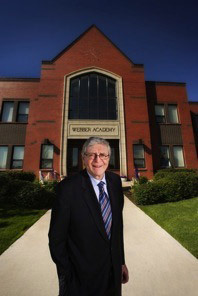 Subsequently, Revenue Canada recognized Webber Academy as a charitable organization. All revenue generated goes directly back into the school and benefits our students. The school is located in southwest Calgary in a beautiful setting overlooking the foothills and mountains to the west. The facilities consist of a Kindercentre for four and five year old students, a main campus building with two large gymnasiums for Grades 1-12, a modern High School Science Centre and a Performing Arts Centre with a 500 seat theatre, a 400 meter running track, soccer field and cross country trails through the aspens.